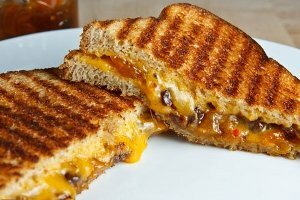 The grilled cheese is one of the best sandwiches out there, and, let’s face it, one of the least healthy choices around. Soaked in butter and fried, often made with full fat cheeses and white bread, it can be a heart attack waiting to happen, full of fat and high in both calories and refined carbohydrates. How can you make a grilled cheese sandwich part of your healthy lifestyle? Start with a good bread choice. Whole Wheat, whole grain, multigrain – avoid breads that contain white flour, bleached white flour, and high fructose corn syrup. Pick a bread with a high fiber content – at least 3 grams per serving. Choose the right cheese. Select a low-sodium natural cheese with no artificial colors, and look for a cheese made from lower fat milk. A stronger flavored cheese, like a sharp or New York sharp cheddar, will allow you to use a little bit less and still have the same pleasurable taste. Avoid butter. Sad, but necessary. Butter is extremely high in fat and calories, and it’s not necessary to making a delicious sandwich. Spray your pan with a little bit of olive oil, instead. Olive oils are available with herbal blends and they add a nice touch. If you really must have a buttery flavor, use a non-hydrogenated butter type spread. Explore alternatives to frying. Panini pressed, toasted or broiled – all can be great lower fat methods of cooking. Realize that the sandwich isn’t the entire meal. A sandwich that is a bit higher in fat can be balanced out by eating half of it, paired with a salad and some fruit. Add tomato, avocado, apple, sliced turkey or low fat ham. There are some delicious versions of the grilled cheese with less traditional ingredients. What are your favorite ways to enjoy a grilled cheese sandwich?